So you’re sitting at your desk, clicking your pen, sighing and killing time, staring at the boatload of work with labeled deadlines, all because you “don’t feel like it”. 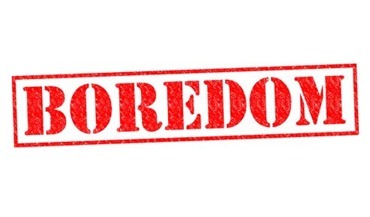 Boredom is the state of being “actively disengaged” while doing a certain task. A Gallup study claims that at least 70% of the American employees voluntarily leave their jobs! That’s huge. The companies are confused about what will inspire their employees to work because the free lunch and soda sure aren’t working. It’s very natural for anyone to feel bored. Being bored breeds laziness and kills productivity as well as speed. The most bored person once exclaimed, “Bored of being bored because being bored is boring!”. Sounds more like a tongue twister. Boredom at work costs a lot to entrepreneurs. To eliminate boredom is superficial but you sure can curb it. If it’s a Type A boredom, here the employee is in control and he has to derive ways to drive boredom away. Say you are doing Task A for a week and it seems very demotivating because the task is time consuming. In such cases, you must find ways to recharge and get back to work with more energy and productivity. 1. De-clutter your workstation to make your desk look neat and tidy. Re-organize things and change the file locations and use a different cabinets to fill things with. What happens in a monotonous work set up is you know where the glue is, marker is, file A is and it’s no brainer and the creativity goes down. But when you re-arrange your desk, you manage to make it look cleaner and discover spaces you never used and your brain loves new surprises. 2. Talk to your co-workers over a cup of coffee. 3. Instead of spending time on Facebook waiting for to like , tag and poke, have a list of websites you always wanted to visit but eventually you forgot (go to stumbleupon.com and register your likes and it will compile a list of best websites on the related topics). 4. Learn a new language/discipline because learning something new keeps our brain active and refreshed. 5. Call up your parents, spouse, children, relatives, friends too see what they’ve been upto or any other apparent reason. 6. Restart an old hobby you had. Like sketching. 7. Take personality, mental quizzes. You’ll be surprised at how rejuvenating these are. Do something for your overall development. 8. Take time out to laugh because that’s the biggest and best stress buster. Read some funny blogs, jokes etc. 9. Listen to music, always a good thing to do. 10. Take a walk outside on the office premises. Just walk by yourself and block all the work thoughts and only focus on the life outside the cabin. 11. Rejuvenate yourself by playing outdoor games like basketball, tennis, badminton or by working out. 12. Plan the calendar for the next coming days with to-dos and should-dos. To increase your productivity make sure you don’t think about anything that’s related to work. Also make it a point to do this by yourself. This is your “Me” time. You can socialize later. But time your time-out. Over indulgence may lead to addiction. The only role for the employer here is to create an infrastructure that supports employee welfare. Now talking about Type B boredom, where you just can’t get your focus on the task at hand. In such situations the employer/the boss is in control and he must have ways to detect it. Some of us don’t really like certain types of work for many reasons. The first and foremost responsibility of the employer is to understand his team while assigning work. The employer must understand that we all need not like what we are supposed to like. For example, an accountant with a B.com degree might have a personal interest in Sales marketing but with no degree to confirm the liking. It’s quite absurd to ask the person to again pursue a marketing qualification; instead it would do the company a world of good to get him started on initial job assignments in the field of his interest. The company must makes efforts in discovering what each person aspires to be while working in the company. That way each manager knows who wants what and when that is given, the employee is more than happy doing something he loves than what’s thrown at him. This is the only permanent and “sure to work” cure to eradicate type B boredom. A bumper sticker on a car said, “Only boring people are bored!” Very true. So it’s time to turn a boring day into an eventful one because you’re not boring. An aspiring globetrotter & CA in the making, feel like there couldn’t be a more exciting time to be alive and happening. Google Grand Diwali Mela, Too Little Too Late? 5 Tips to Hire the ‘Right Fit’ for Your Organisation!